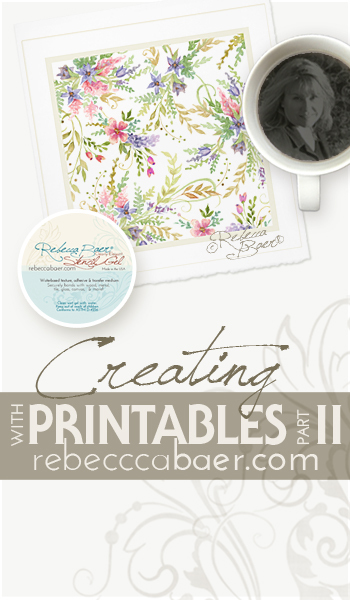 In part one of "Creating with Printables", we discussed using Clearly Elegant Stenciling Gel* as a decoupage medium along with a few pointers for improving your results. This gel can also be used to transfer images without the paper on which they were printed, which has some obvious benefits. First, they can be adhered to transparent objects like night lights or glass items and light will pass through. Second, the gel is very flexible and can be moulded to fit curved surfaces. When used to create a collage this method allows underlying layers to show. Begin by selecting your image. This process is well suited to toner-based images since ink jet prints are likely to bleed. Magazine imagery, posters and some photos (depending on the printing method) will also work. Experiment with scrap materials to see if an image is suitable. Tape the edges of the image to minimize curling and prevent the gel from getting to the edge and inadvertently adhering the image to your table. You will cut the tape off later rather than try and remove it. Apply several layers (3-4) of gel to the front of the image that you wish to transfer. Dry between coats. Do not thin the first few coats as less moisture means less buckling. As you build the layers you may want to thin the later applications a bit to minimize brush strokes. Continue to add a few more layers of gel allowing it to dry between coats. When complete the image should have a substantial coating of gel, about ten layers. It will feel plastic-like. Allow the gel forty-eight hours to cure. If you fail to let it cure it may over-soften during paper removal. the paper. Let it soak for about ten minutes. The gel will turn a bit foggy, this is to be expected. Use your fingers to rub off the softened paper. Rinse and replace the water as needed. You may want to dump the pulpy water outside or strain it to avoid putting the solids down your drain. Once the paper is removed, hang the image to dry. The resulting transparent image can be adhered to most any substrate with a coat of gel**. Use a brayer to roll out any bubbles when mounting. If the image does not reach to the edges of the surface on which it is being mounted, consider trimming in an oval or other shape suited to the image or create irregular edges similar to deckled paper. 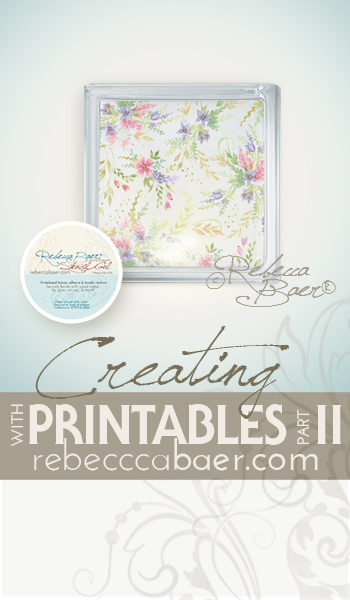 *Clearly Elegant Stenciling Gel was originally developed as an embossing medium for use with stencils. That is beyond the scope of this post but keep your eye out for this topic in a future post. This gel is suitable for so much more! It dries crystal clear and can be used as a gloss gel medium for collage work or thinned for mounting fabric. As an acrylic polymer it bonds with acrylic paint and can be used as a glue. I achieve much better results using this gel when assembling projects (adding embellishments, feet, etc) than either hot glue or stinky glue. **I have had excellent results using Clearly Elegant Stenciling Gel on various wood, paper, glass, fabric, canvas and metal surfaces.